Written by the coauthor of the best-selling book Welding Essentials, this practical guide provides insights, ideas, and tips for solving real-world fabrication problems. By presenting a broad range of methods from different welding specialties and a brief, clear understanding of the non-welding knowledge nearly all weldors must have to advance in their trade, Welding Fabrication and Repair can shorten the time needed to develop effective problem-solving skills. 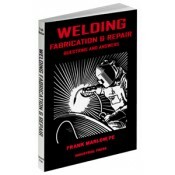 Created for weldors who know the basics and now want to put their skills to better use, this book is one of only a handful of truly “must have” welding references. • A question-and-answer format, providing concise answers to each question. • The capabilities of oxygen and exothermic lances; flame bending, flame straightening, line heating and panel shrinking; industrial threaded fasteners; specialized welding clamps, fixtures, welding platens, and cutting pyramids. • Common welding tools, equipment and accessories, along with a listing of the leading suppliers and their web sites in a separate chapter. • Welding and cutting tables including designs and advantages. • Solutions to common welding problems. • Detailed checklist of considerations in designing products with welds. • 300 original illustrations fully explain concepts, ideas and insights. • The ways weldors solve problems from building up a worn shaft with weld metal, to welding perforated steel screening onto frames, to extending the capacity of a welding machine. • The most common pipe and vehicle welding methods, how weldments can replace castings, and the basics of the science of strength of materials. • Structural steel practices for joints, column splices, bolting and guidelines for sizing welds.